Whether you’re looking for a pair of jeans for kicking around on the weekend or need to suit up to make a great first impression, Haggar has the perfect option to fit your needs. Every one of our product lines offers the perfect combination of comfort and craftsmanship for every occasion — from our casual khakis to our suit separates. Haggar has always lead the industry in wrinkle-free innovation, and perfected a comfortable, no-iron, 100 percent cotton pant in the early 2000s with our Work to Weekend® pants. 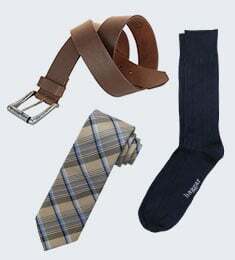 Since then, millions of men have joined the movement to toss out their irons by purchasing these easy-care, versatile pants that can go from the office to off-the-clock with ease. Work to Weekend pants just fit — your body, your style and your life. Given the popularity of our wrinkle-free Work to Weekend® pants, Haggar saw fit to introduce another easycare option in our Premium No Iron Khakis. Slightly dressier and lighter-weight, these pants filled a void in the Haggar Man’s wardrobe and another instant classic was born. Available in a handsome family of neutral colors that go with just about anything in a choice of fits and styles, not only do they look striking, with stretch in the material and a hidden expandable waistband or flex waist, but they also feel really great. And the fact that they are machine washable — well, that’s almost too good to be true. Incorporating Repreve® fibers made from recycled water bottles into our eCLo™ pants and slacks offers our customers a product that not only looks remarkable, but is one they can feel good about buying. Just the fact that eCLo stretchable no iron fabric is machine washable is pretty impressive. But knowing it’s good for the planet makes choosing eCLo a no brainer. 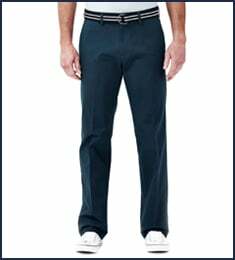 And since they are available in classic, straight, slim, and big and tall fits, as well as a vast selection of colors, there’s an eCLo pant for every Haggar Man. comfort or your ability to move around — so you look sharp regardless of your game. Look put together on and off the green with our Cool 18 Pro line. Take everything you love about our Cool 18 products, upgrade to a premium fabric with four-way stretch for additional comfort and easy movement, then throw in ingenious shirt grippers to keep everything in place during your back swing and you’ll have our Cool 18 Pro line. Feel like a million bucks without spending a fortune. That's what you can expect when you put on one of our J. M. Haggar suits. 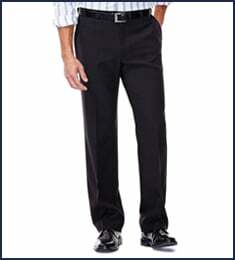 Expertly tailored and premium-quality fabric with built-in stretch and incredible attention to detail. At Haggar, we know not every guy is cut from the same cloth when it comes to sizing. Thanks to the Haggar Big and Tall line, it’s easy to find quality clothing options that can measure up to the high expectations of our customers when it comes to style and affordability. 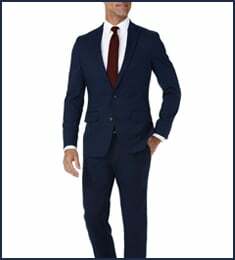 Many of the lines listed above, such as Work to Weekend, Premium No Iron Khaki, Cool 18 and eCLo Stria, as well as some of our suit separates, are also available in Big and Tall sizes, so you’re never short on options. Check out the Big and Tall section of our site to see our full selection.